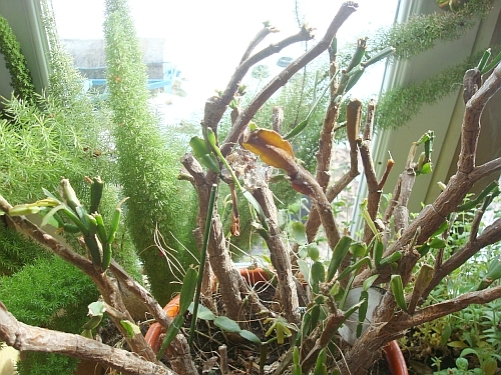 Himself brought Grandmother’s Christmas Cactus over from the studio today. It was not thriving over there and I thought it might like it here where there is a bit more heat and light. What you are seeing is a very large and very old plant that has sat outside each summer for as long as I’ve been acquainted with it. It was this big when I first saw it in 1979 so I have not a guess at how old it might be. But this summer the deer decided, one day when we were gone, that it was eatable . I think it’s going to survive but we were really bummed to see this damage. Since old Jack died the deer know no bounds. They come right up to the house and are not easily chased off. They are not a bit afraid of Cori the Corgi who can terrify a grey squirrel. Well I guess we won’t be putting the plant outside this year and have our fingers crossed that it likes it in here with us. There are signs of new leaf buds so we a more optimistic now.